2 Bedroom Apartment with high stud and fantastic seaviews. Directly across the road from popular Lyall Bay Surf beach. This apartment is above the Botinist Cafe, and within easy walking distance to other Cafes/restaurants. Watch the surfers, boats and planes from the Kitchen/Living room. Close to the airport - 2 minute drive. Bus stop across the road with regualr services into the CBD. Well insulated with heat pump for added comfort. 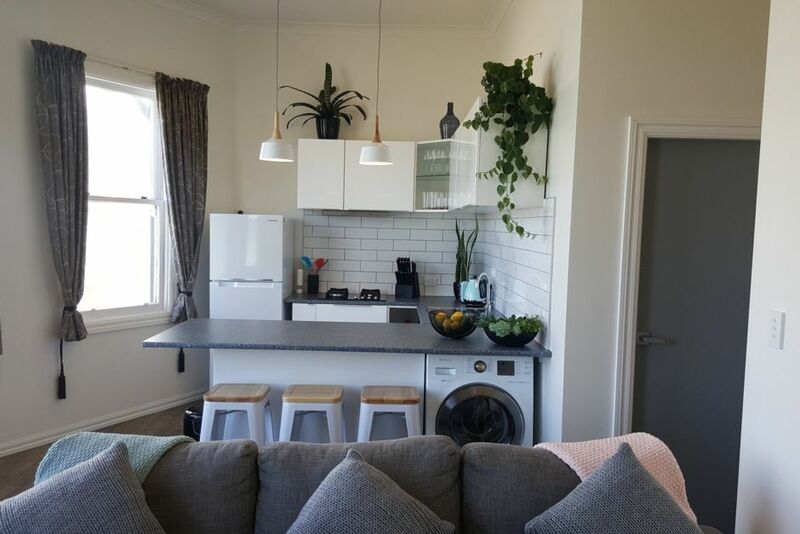 The apartment is spacious and right across the street from beautiful Lyall Bay. The view of the bay and all the beach activities is fantastic. Also close to 3 cafes - Maranui, Spuce Goose and the Botanist. It’s also right on the bus line into the city and just across from the airport. It does get a fair amount of street noise starting early in the morning but being early risers, it didn’t really bother us. We’d also suggest the windows be cleaned to make the view even better. Overall a great place to stay just outside the city. Fantastic location, straight across the road from Lyall Bay beach and so central for cafes. Said it all before really ...... thought this was a great option for couples and families (playground across the road). Public transport makes getting into Wellington really easy. awesome views (once the wind and rain gave up). awesome views (once the wind and rain gave up). vegetarian restaurant below. bars and food down the road. great views.